We have thoroughly tested the services provided by Essay-Bag.com in order to help you understand how this writing company works. At first sight we have noticed the website has a clean interface and clear overall structure. We could easily browse through the pages, and understand very fast the types of services provided. One extremely important feature that popped in front of our eyes was the instant 20% discount offered for first time orders. This is a very nice discount, considering the limited budget of almost every student. This writing company is focused on providing academic custom essay writing services for students in Australia. 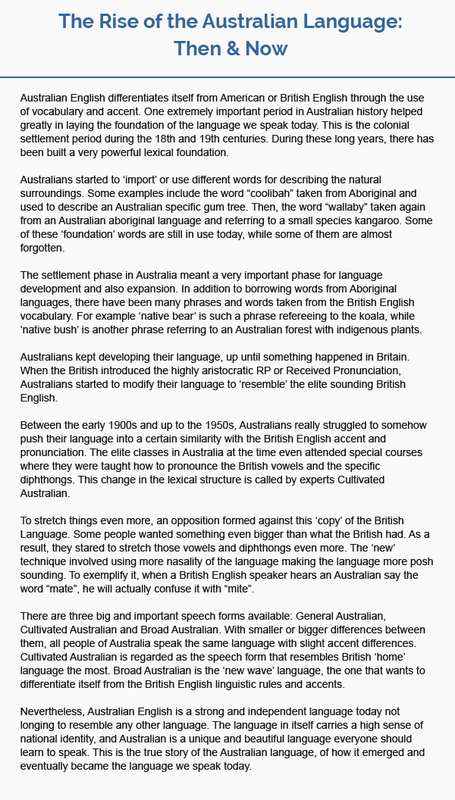 There are not too many such writing services providing Australian English solutions, so this is a good thing. Australia has some very strict academic requirements, and students struggle a lot with completing writing related tasks. We strongly believe the key to good academic achievements in Australia is to hire the right type of assistance for assignments homework, essays and other academic projects. Standard quality writing with a 10-day deadline will cost $26.53. As the deadline becomes shorter, the prices increase because the writers need to work more efficiently within a shorter time. For a 4 days deadline the cost is $30.51 per page, for 48 hours the cost is $43.79, while for 12 hours the price is $51.75. The writers can complete assignments even on an extremely short notice of 3 hours, but then the price is $55.73. Premium Quality writing- the most popular choice among students. For the most extended deadline of 10 days, the cost is $29.19. For 5 days deadline the price is $31.84, while for 48 hours the cost is $46.44. Premium quality writing is also available with a deadline of only 6 hours, and the price is $54.41 per page. Platinum Quality writing- the highest academic level work, delivered by top PhD degree writers. The cost per page for a 10 day deadline is $31.84. For one week deadline the price is $33.17, and for 3 days it is $41.13. Platinum quality writing is also available for very short deadlines of 6 hours and 3 hours -$63.70 and $70.33 per page, respectively. We could also notice there is not such a huge difference between PhD quality writing within 6 hours and within 3 hours. We consider the usability of a website one of the most important factors. When people can easily navigate through the pages and loading time is quick, users enjoy a great experience. We have tested Essay-Bag.com for usability for more than one hour. We tried to switch between pages very fast, scroll, click on tabs and even tested the chat window option. Everything works fast and accurate, and we can say this website has a perfect usability. Even people who are not that well acquainted with the use of websites, will find that Essay-Bag is pretty simple to use. After all, simplicity and user friendliness are very important. People do not want to land on websites where they see different advertisements and banners pop in front of their eyes. These popups would only delay the entire navigating experience. Essay-Bag also has a very clean and clear structure overall with highly organized content. As we checked the home page, we could see there the following quick tabs: Essays, Prices, Order Now, Our Service, Our Writers, About Us, Contact us and How it Works. These tabs are arranged in a highly logical manner. Students who wish to place very fast their order, will not have to read boring information first. They can simply click on ‘Order Now’ and they are ready to get help with their writing project. Under the How it Works section, everything about the service is explained in detail. Students can read here about the services offered, about how they can place an order, or what are the guarantees and bonuses offered by the company. With one single click on any of the tabs, users get instant access to valuable information about this company. Overall, usability gets an excellent rating from the part of our team! We highly believe that customer support is the heart of any business. When customers are satisfied with how they are treated by a company, they will return back for more services. Now, at Essay-Bag.com we noticed they take customer support very seriously. All throughout the website you can find several contact details such as a Toll Free phone number, a chat window, or an email address. This helped us understand that the company intends to do real business and the representatives are available to give assistance to users. We have tested their support section, because we wanted to see how fast they answer our questions. First, we used the chat option, and a friendly customer care representative was available in 2 seconds. He helped us with everything we asked from him. He kindly explained to us the pricing schedule, issues regarding deadlines but also offered to assist us with placing an order. For the chat customer support option we give an A+ rating to this company. Next, we used the phone option. We called them and asked if it is possible to receive a paper within a 3 hour deadline as they advertise on the website. The assistant told us he will assign one of their best writers to the project, given the urgent deadline. Said and done. Within 5 minutes, we were already discussing on the phone with a History PhD writer about our urgent project. As a last test, we also sent an email asking general questions about the services offered. Even though we did not specify we want to place an order, the response came in about 20 minutes. With the huge workload they have and hundreds of emails to answer every day we were really impressed by the rapidity of this company. Customer support can be really trusted, so students are welcome to contact the experts for very fast answers and quality assistance. Each serious review will contain a thorough testing of all the services of a company. Therefore, we placed an order for an essay in order to check on the quality of the paper. We must say that we asked the team to write the essay in Premium quality (most popular choice) and we gave them a deadline of 48 hours. Our essay was not too long, so we thought 2 days is enough to complete. The writers even told us that if we need the essay on an urgent basis they can deliver it. They said they can write the essay even within 6 hours or 3 hours. Back to our essay order. We received it through email delivery just as expected. We did not give too many instructions to the writers, because we wanted to see how they will cope with little guidance. The result was beyond our expectations. The writers delivered an essay that exceeds the standards of what we call medium quality. Obviously, this essay was written by someone with a high academic achievement. We noticed the essay was filled with quotes from important writers, and we could find plenty of references to authority books, magazines and online journals. The essay did not contain even the smallest mistakes. We had three different team members carefully read the essay and look for editing or proofreading mistakes. They couldn’t find anything, so we are entirely happy with the quality of the work provided. We carefully read the essay and saw that it did not contain any ‘fluff’ or filler content. The essay was written on topic, using relevant words and phrases just like an essay should be. We could easily enter a Literature contest with this essay, such great was the quality. We highly recommend students to confidently place their orders for any writing projects they need. They will not be disappointed with the results. The writers employed by Essay-Bag deliver top quality Australian English academic writing solutions. All the writers have earned their degrees at important universities across Australia. They will never compromise on quality, and you can rest assured you will pay only for the pages you need and nothing more. It is important to understand that the writers are native Australian experts. They can provide students with any difficulty level papers, on almost any deadline. The high academic level of each writer is thoroughly tested before being hired. They have to go through complex grammar, literature, editing and proofreading tests. They also need to complete lower grade assignments for the first few months, and they will be advanced only if they prove they can offer excellent quality to customers. All writers are capable of handling even the most demanding projects in Australian English. They also understand very well the requirements of different learning institutions across the country. They can adapt to these instructions and requirements, and deliver custom tailored papers that bring students the good grades they are dreaming of. There are writers with different diplomas available such as MA or PhD, and students can specify the academic level of the writer to work on the project. An expert with a Doctorate degree can assist on writing your Dissertation and then success is guaranteed. Investing in good quality writing help is investing in your future. You cannot afford to get bad grades on your exams because you did not have the time to study. Entrust the writing projects to this team of writers, and then you will have enough time to focus on other tasks such as studying for upcoming examinations.